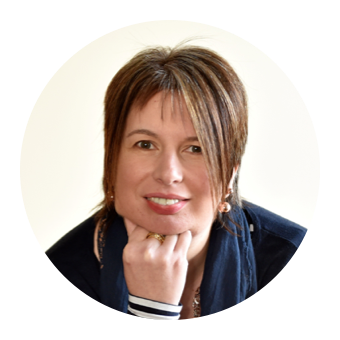 I've mentioned on both the blog and my social media channels on countless occasions that I am either a pipe band widow or a pipe band groupie. All three of my family play with Newtonhill Pipe Band. Foodie Loon is a piper, boy a snare drummer and girl a tenor drummer. I have the choice to either stay at home in blissful peace or join them on their musical adventures. This usually entails trips to local school fairs, village galas, highland games and suchlike, but sometimes the opportunity arises to venture further afield. Back in 2016 my husband and son travelled with the band to Amiens for commemorations of the centenary of the battle of the Somme. It was a fantastic experience for all concerned and when the invitation came to participate again in 2018 Newtonhill Pipe Band immediately set about fundraising in order to travel with an even bigger contingent. 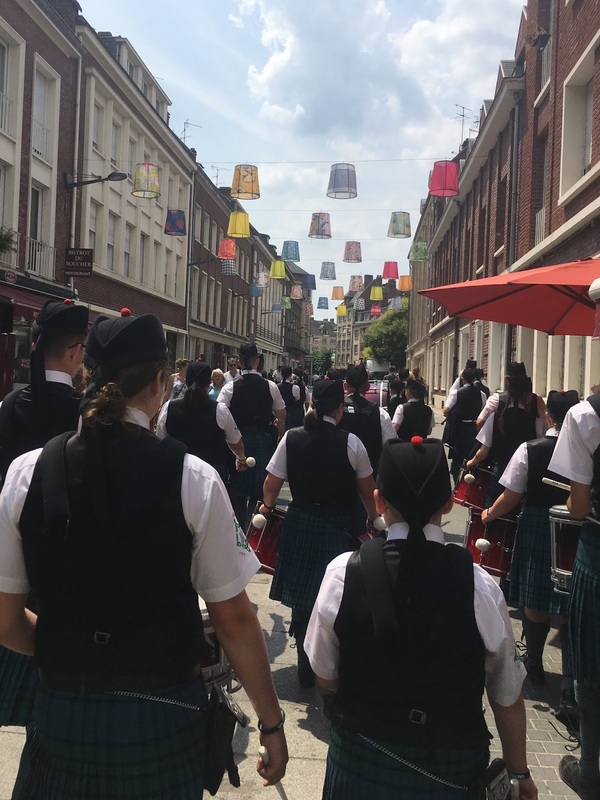 Between 7th and 8th July 2018, 19 bands congregated once again in Amiens and Newtonhill Pipe Band travelled with a strong contingent of 43 with 31 of those being players and 15 of those being under the age of 18. Our journey to Amiens entailed a coach trip to Edinburgh, flight to Brussels and a coach to our apartments in Amiens. All sounds quite simple until you take the logistics of travelling with kilts, drums and bagpipes into the equation! The city centre was quite literally jumping on the Friday night when France were playing Uruguay in the World Cup quarter finals. Following unpacking and ensuring all instruments and uniforms were present and correct it was time for a practise session. The remainder of the afternoon and evening was taken up with eating, drinking, socialising and exploring. 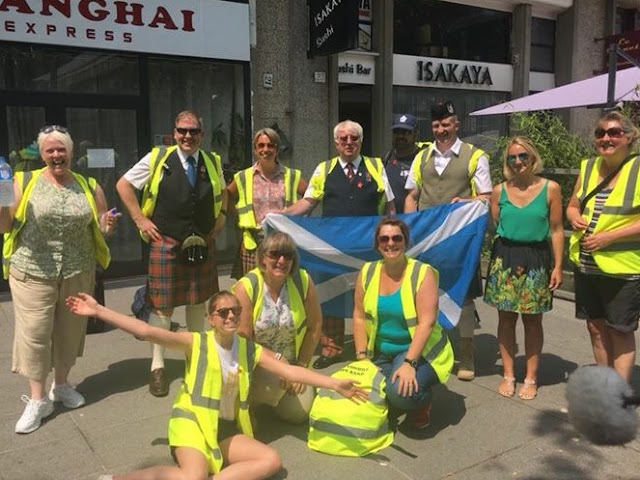 The official programme kicked off on Saturday 7th July when downtown Amiens came alive with pipe bands and bagadoù from France, Belgium, England, Germany and Scotland performing at seven major sites throughout the city. Newtonhill played at Place Gambetta beneath colourful umbrellas and Place Notre-Dame in front of the stunning Cathedral. A stage of the Tour De France was to be finishing in Amiens the following weekend and the the umbrellas were in the colours of the riders jerseys. Yellow, white, green and polka dot (admittedly I didn't actually work this out at the time!) The huge gothic Cathédrale d'Amiens dominates the city centre. It is the tallest and largest cathedral in France. Built between 1220 and 1270 it has been listed as a UNESCO World Heritage Site. Despite heavy fighting in the area during both World Wars the cathedral miraculously escaped serious damage. In between performances all the bands congregated in the United Pipers for Peace Village. 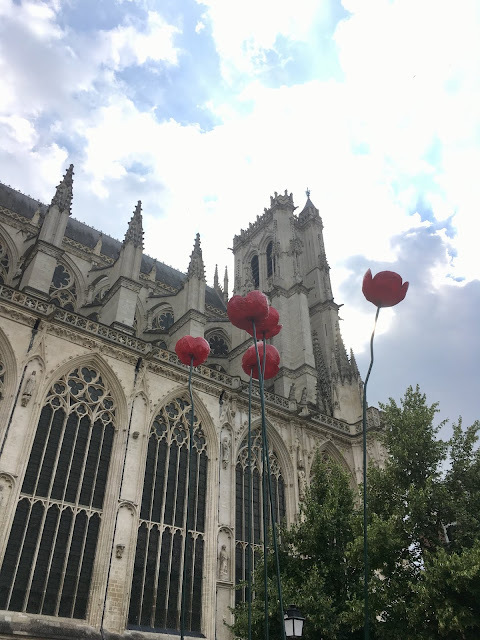 Located behind the Cathedral, the “Jardin de l’Evêché” was poignantly decorated by Koklyko an art installation of poppies made from recycled bottles. Following dinner in the canteen at a local university we returned to play once again outside the Cathedral along with bands from Huntly, Ballater and Sonerien. This was a prelude to the evening light show 'La Cathédrale en Couleurs' so there was a huge captive audience. This spectacular production to music culminates in a recreation of the western façade of the cathedral as it was originally painted in multiple colours. It was so wonderful that some of the group headed back to watch it again the following two nights. The free show takes place throughout the summer and again over Christmas and New Year. It would be most remiss of me not to mention what we ate along the way. Before travelling to France I'd checked out the culinary specialities of the area. Ficelle Picarde, a regional crêpe stuffed with ham, onions, mushrooms, covered with grated cheese and baked in the oven. Alas I only really managed to score off one and a half from the list, the crepe and a supermarket version of duck pate. However whilst others were sending their Steak haché, back to the kitchen for further cooking, I was tucking into Steak Tartare. We ate in a combination of restaurants, a university canteen, hotel breakfast buffet and picnics from the supermarket. Big thanks to the French speakers in the party who helped with translations and ensured we all knew what it was we were ordering. Monday was a free day for rest and recuperation or further exploring. Some headed to Paris for the day, others to visit cemeteries and a number of us stayed in Amiens. Following a return visit to the interior of the Cathedral it was time to explore Les Hortillonages by boat. Also known as the Floating Gardens of Amiens, Les Hortillonages are marsh gardens that float in the water. A picnic in Saint-Pierre park followed then some messing about in Pedalos. In the evening we met up with the local Samarobriva pipe band who had organised and hosted the whole event. This led to improvisation with wheelie bins as bass and tenor drums and brooms as mace and another performance in front of the Cathedral. The whole trip was a fantastic and moving experience from start to finish and I was proud to be a small part of it and even more proud of my piper and drummers. 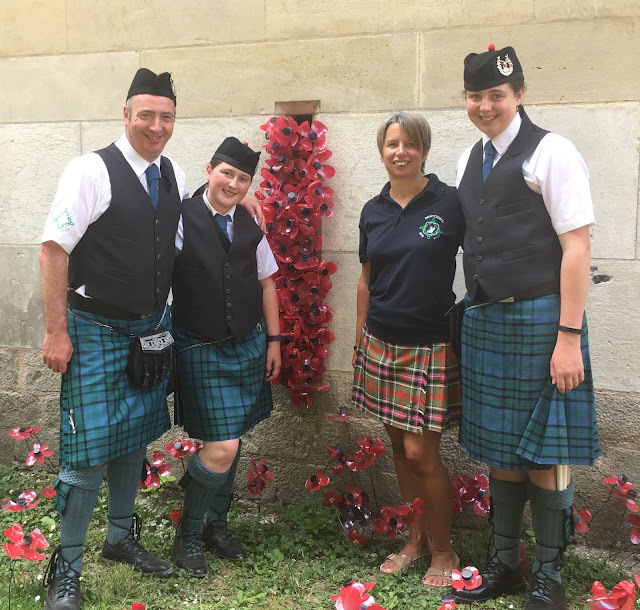 United Pipers for Peace 1918 - 2018, remembering the role, service and sacrifice of pipers during the First World War.